The season 2018 could be Valentino Rossi's farewell year in MotoGP: The thoughts of the end of the active career make for an uncomfortable feeling. Only fifth place in the drivers' championship: Valentino Rossi showed 2017 the worst season since returning to Yamaha five years ago. The runner-up of the past three years only won one race in 2017 and struggled after the summer break with his Yamaha M1, which was not good enough to clinch the World Championship title this season. In the camp of the "Blue" it does not look good at the moment. 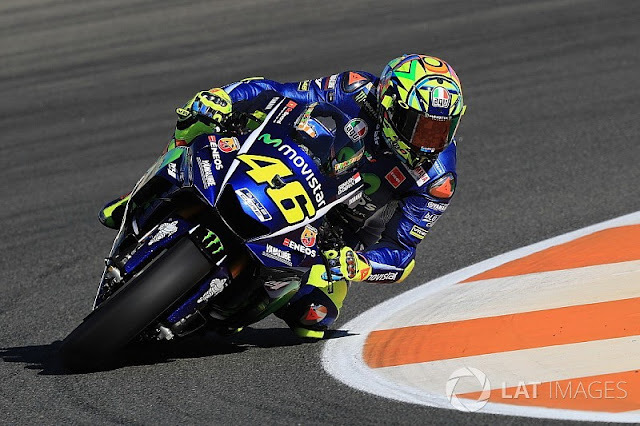 If there is no noticeable uptrend in winter, Rossi will probably finish his career in a year. Are the thoughts of the ever-shrinking resignation scary? It's terribly frightening, I love my life, it's all about MotoGP and motorcycling, you have to find something else, "comments Rossi in an interview with 'BT Sports'. Rossi has already secured a replacement with the VR46 academy. "It's not the same, but it's similar, sometimes we track the races of Moto3 and Moto2 on Sundays and then we're done (laughs), it gives me positive energy," notes Rossi who does not rule out one day to set up a MotoGP team. But before that he would like to try again in 2018 to win the long-awaited tenth title. "That's the goal, it's not easy and very difficult, but not impossible," says Rossi. "Winning the championship is the big goal, it's about winning races or showing good podiums on the podium, it's important that you enjoy it, and in 20 years I've learned that the feeling you have in the twelve hours following a win or a race like the one at Phillip Island is why you drive, that's the biggest motivation, not statistics, "says Rossi. In February 2018, Rossi celebrates his 39th birthday. The upcoming MotoGP season will be Rossi's 23rd year in the Motorcycle World Championship and 19th in the premier class. His current two-year contract expires at the end of the 2018 season. Rossi said in recent weeks that he wants to make his future dependent on his own competitiveness in the first races of the season.